Here is the list of the hotels near Frayssinhes. Book your hotel near Frayssinhes today, Monday 13 May for the best price, reservation and cancellation free of charge thanks to our partner Booking.com, leader in on-line hotels reservation. Below here is the list the 50 closest hotels of Frayssinhes, sortable according your criteria. You will find the position of these accommodations on the Frayssinhes hotels map. Ferienhaus mit Pool Teyssieu 100S is situated in Teyssieu. Guests staying at this holiday home have access to a fully equipped kitchen. Rocamadour is 45 km from the holiday home. The nearest airport is Aéroport d'Aurillac Airport, 51 km from Ferienhaus mit Pool Teyssieu 100S. House Biars-sur-cere - 4 pers, 70 m2, 3/2 is a holiday home situated in Biars-sur-Cère. The holiday home boasts garden views and is 37 km from Brive-la-Gaillarde. The holiday home features a TV, a well-equipped kitchen with a fridge, and a bathroom with a shower and free toiletries. Rocamadour is 24 km from House Biars-sur-cere - 4 pers, 70 m2, 3/2. The nearest airport is Brive Dordogne Valley Airport, 40 km from the property. Ferienhaus Sousceyrac-en-Quercy 100S is situated in Comiac. The accommodation is 47 km from Aurillac. The holiday home includes 4 bedrooms and a kitchenette with a dishwasher and an oven. Figeac is 50 km from the holiday home. The nearest airport is Aéroport d'Aurillac Airport, 49 km from the property. Apartment Loti, a property with a garden, is situated in Bretenoux, 6 km from Castelnau-Bretenoux Castle. This apartment also has free WiFi. This apartment comes with a seating area, a kitchen with a dishwasher, and a TV. Private parking is available at the apartment. Cycling can be enjoyed nearby. The nearest airport is Brive Dordogne Valley Airport, 43 km from the property. Bed and Breakfast Bretenoux Preferred hotel ! Set in 10 hectares of parkland, this 15th-century farmhouse is located in the village of Bretenoux. It offers en suite guestrooms with free Wi-Fi and a terrace with views of the Château de Castelnau-Bretonoux. Rooms at the Domaine de Borie guesthouse are simply furnished and feature original wooden beams and stone walls. Rooms have a view of the park, courtyard or castle. Breakfast is served each morning at the Domaine de Borie. Guests are invited to relax on the guesthouse’s terrace offering panoramic views of the village’s château. Additional facilities available include a darts board and board games. Bretenoux Train Station is located 1.7 km away and the Gouffre de Padirac caves are a 20-minute drive from the guesthouse. 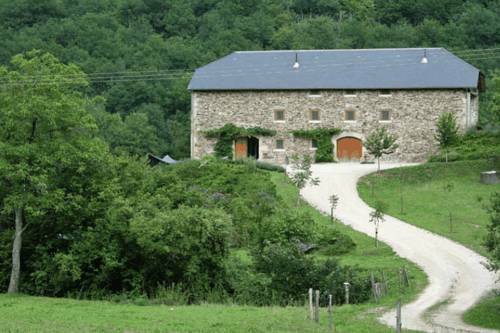 Chambres du Pont de Lauque is a B&B located 800 metres from the heart of Bretenoux. Free WiFi access is available, as well as a large garden with outdoor furniture. The guest room comes with a terrace. Featuring a bath, the private bathroom also comes with a hairdryer. In the morning at Chambres du Pont de Lauque, a breakfast including homemade marmalade and cakes is served. An array of activities can be enjoyed on site or in the surroundings, including cycling and hiking. Gouffre de Padirac is located 14 km from the B&B and Rocamadour is 29 km away. Biars Train Station is 3 km away and the property offers free parking. Hotel Belle Rive is located in the Dordogne village of Gagnac-sur-Cère. It has 12 individually styled rooms with private bathrooms, cable TV and free Wi-Fi. The Belle Rive’s restaurant offers a seasonal gourmet menu, which can be enjoyed on the hotel terrace. Guests can also relax with a free newspaper and a drink in the hotel bar. The Hostellerie Belle Rive is situated next to the river Cère and guests can enjoy hiking and cycling in the surrounding countryside and there is a golf course nearby. Situated in Sousceyrac, La Roussilhe offers accommodation with free WiFi. Fitted with a terrace, the units feature a flat-screen TV and a private bathroom with shower. Guests at the bed and breakfast can enjoy a continental breakfast. The restaurant at La Roussilhe serves Belgian and French cuisine. The accommodation offers an outdoor pool. Guests at La Roussilhe can enjoy fishing nearby, or make the most of the garden. Rocamadour is 47 km from the bed and breakfast. The nearest airport is Aéroport d'Aurillac Airport, 41 km from La Roussilhe. Featuring accommodation with a terrace, Maison De Vacances - Cahus is situated in Gagnac-sur-Cère. This holiday home has a garden, barbecue facilities and free WiFi. The holiday home includes 3 bedrooms, a kitchen with a dishwasher and an oven, as well as a coffee machine. A TV and DVD player are available. The holiday home offers an outdoor pool. A children's playground is available for guests at Maison De Vacances - Cahus to use. Rocamadour is 46 km from the accommodation. The nearest airport is Brive Dordogne Valley Airport, 56 km from Maison De Vacances - Cahus. Ferienhaus Girac 100S is located in Girac. It features river views and free WiFi. The holiday home includes 5 bedrooms and a kitchen with a dishwasher and a coffee machine. A TV is offered. Brive-la-Gaillarde is 43 km from the holiday home. The nearest airport is Brive Dordogne Valley Airport, 40 km from the property. Offering a barbecue and views of the garden, Camping Magali Plage is set in Liourdres. Sarlat-la-Canéda is 47 km from the property. Free WiFi is offered. Some units include a dining area and/or terrace. There is a kitchenette, fitted with a fridge and stovetop. There is also a coffee machine and a kettle. Free private parking is available at this camping site. Camping Magali Plage includes a children's playground. Guests can enjoy a meal at the on-site restaurant or a drink at the bar. The property also offers packed lunches. Guests can enjoy various activities in the surroundings, including fishing, canoeing and hiking. Brive-la-Gaillarde is 34 km from Camping Magali Plage, while Rocamadour is 21 km away. The nearest airport is Brive Dordogne Valley Airport, 37 km from the property. Located less than 20 km from Argentat, Les Cabanes Silvae offers ecological-friendly accommodations set in tree houses. They all feature a furnished, private terrace with a tree view and a continental breakfast is provided. The accommodations have private toilets and give access to a bathroom situated at the bottom of the private stairs. The beds are surrounded by a mosquito net. The continental breakfast can be brought to the comfort of your terrace. Guests can request a meal made with local products such as caramelized figs or a packed lunch. Guests can go canoeing 20 km from the residence or go for a swim at Etang du Moulin, situated 2 km from the property. The A20 motorway is 50 km away. Ferienhaus Beaulieu-sur-Dordogne 200S is set in Altillac. This holiday home also has free WiFi. The holiday home includes 3 bedrooms and a kitchen with a dishwasher and an oven. Brive-la-Gaillarde is 45 km from the holiday home, while Rocamadour is 44 km from the property. The nearest airport is Brive Dordogne Valley Airport, 50 km from Ferienhaus Beaulieu-sur-Dordogne 200S. Below here is the hotels map of Frayssinhes. Names and details of Frayssinhes hotels can be shown on the map clicking on the prices icons.